Wasp: What are you gonna be for Halloween?! Wasp: Oh my gosh! 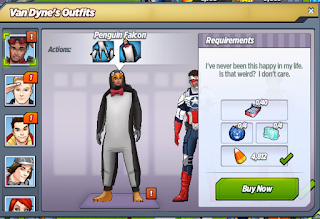 Because you're called Falcon, and penguins are also birds, but penguins can't fly, hence the comedy! Wasp: Are you gonna slide on your belly?! Wasp: You better slide on your belly! 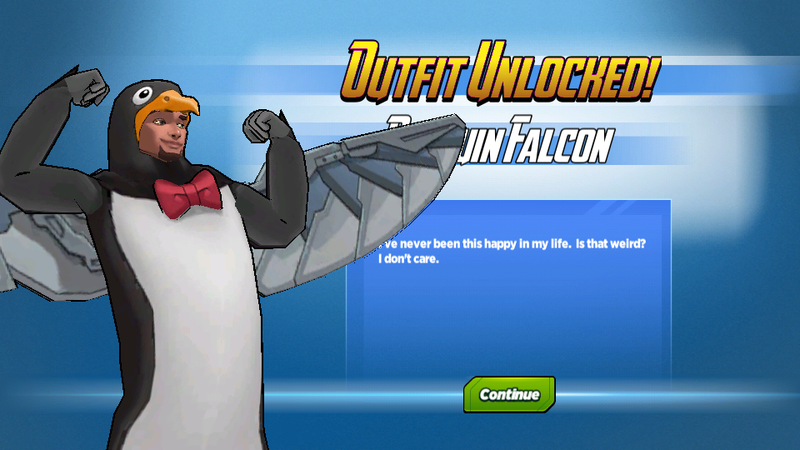 Penguin Falcon: This is the best decision I ever made. 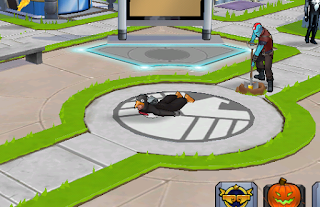 Captain America: Better than joining Avengers Academy? Captain America: Better than becoming my best friend? Captain America: I'm not gonna disagree. It's an outstanding costume. Penguin Falcon: I've been watching a lot of penguin videos. Wasp: Slide on your belly?! Let me get my phone! Where's my phone?! I'm freaking out! Penguin Falcon: Don't you think you're taking this a little far? It's a costume. Black Widow: It's a lifestyle. Penguin Falcon: I need to go to the zoo. Immediately. Black Widow: Did I just see a bunch of penguins following you? Penguin Falcon: Yeah. I'm pretty sure I'm their dad now. Black Widow: This is just wrong. Penguin Falcon: Don't say that in front of the children! 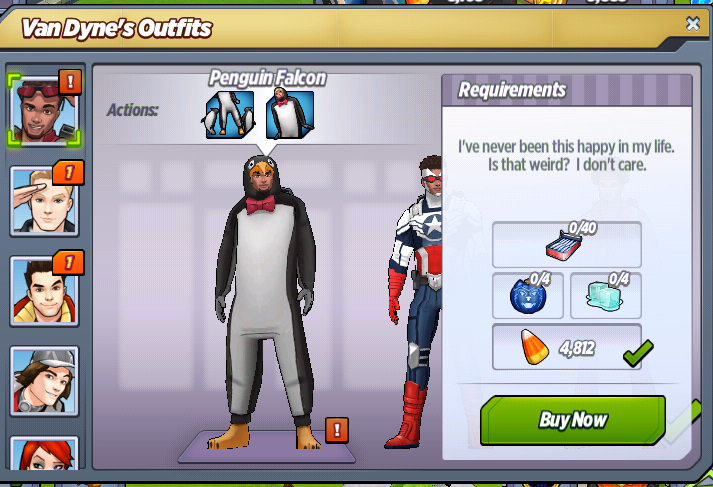 Penguin Falcon: Weren't you a ballerina? Black Widow: If you call me Mean Ballerina, I will kick you in your penguin belly. 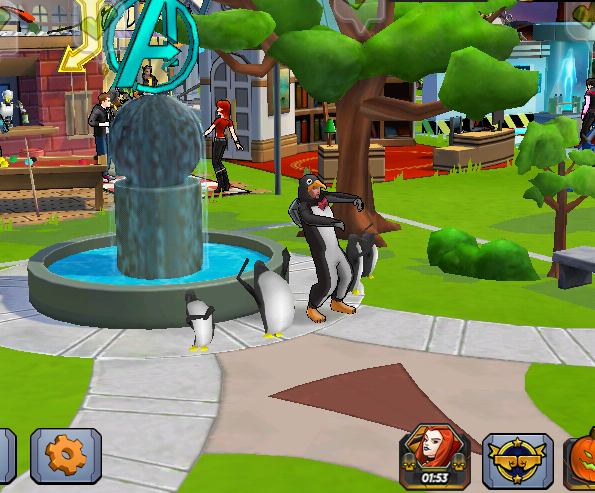 Black Widow: Crazier than acting like you're an actual penguin? Penguin Falcon: I'm about to go maximum penguin. Black Widow: Where are your penguins? Penguin Falcon: Back to the zoo. It was sad, but apparently commandeering wild animals is frowned upon. Black Widow: I'm sorry for your loss. Maybe you just weren't meant to be a daddy penguin. Penguin Falcon: Maybe. But I'm still never taking off this costume. What do you think of Penguin Falcon? Where are you on unlocking him?